Rusted metal barrels filled with a dark, dusty material stand in a warehouse on the site of the former Union Carbide plant in Bhopal, India. Dirt and sand trickle from worn plastic bags piled up in a corner. The barrels contain toxic materials, but they have no lids and are not inside any containers. Any slum child can pick the lock on the entrance gate. It’s hazardous waste storage, Indian style. Today the people in Bhopal still live with the consequences of the gas cloud and are still fighting for compensation. It took a decree by India’s highest court for the toxic waste to finally be removed. The partner the Indians found to perform the task is the German Society for International Cooperation (GIZ), a German government agency that provides services for sustainable development. A February letter from the GIZ to the relevant ministry in Bhopal mentions disposal “at an incinerator in Hamburg.” This information is incorrect, say GIZ officials, noting that the incineration contract will be put out to Europe-wide tender, but only after the contract has been signed. The old factory site in Bhopal, with its rusty tanks and dilapidated clusters of buildings, is like a ghost factory. A sign in the former control room reads: “Safety is everybody’s business.” Stray dogs search for shady spots in the ruins of the laboratory building. 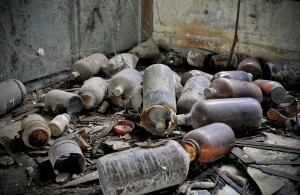 Dusty bottles and containers filled with substances like benzene, potassium hydroxide and methylene chloride stand under the laboratory tables. No one knows exactly which highly toxic substances were buried at the site after the disaster. Germany’s Federal Ministry for Economic Cooperation and Development, which the GIZ answers to, has already approved the project. The GIZ had the draft contract sent to the Indian government last week. The most problematic issue is the question of who assumes the risk and costs for possible transportation accidents on German soil. According to the GIZ presentation, “the current owner remains responsible for the waste until its final disposal.” A bank guarantee is also required, in case something goes wrong en route to the incinerator. The disposal of Bhopal’s toxic waste in Germany, about 6,500 kilometers (4,000 miles) away, will cost Indian taxpayers about €3.4 million ($4.25 million). “We couldn’t have wished for a better partner than the Germans,” says state Urban Development Minister Babulal Gaur, 62, who is responsible for the rehabilitation of the gas victims and is the former chief minister of Madhya Pradesh. Gaur would have preferred to dispose of the waste in India. “I’ve held that dirt in my own hands. The material lost its toxicity long ago,” says the minister, downplaying the hazards. But all Indian states that were candidates for reprocessing went to court to fend off the toxic waste. According to analyses performed by the German disposal experts, the fears of the Indian states are understandable. According to the GIZ report, the material — supposedly pesticide-contaminated soil which is not directly connected to the 1984 accident — still contains “problematic residues” of chlorine, mercury and heavy metals. “The 350 tons that we intend to dispose of now are just the tip of the iceberg,” says Hans-Hermann Dube, the South Asia director for GIZ International Services, headquartered in the Indian capital. In truth, as Dube points out, the entire former Union Carbide plant is a case for special waste disposal. The problems associated with contaminated ground water, which still affect Bhopal residents today, are another issue altogether. “In the long term, India will need its own facilities to dispose of chemical and other toxic waste on-site and in environmentally correct ways,” says Dube. The real question is why it took almost 28 years before the disposal of the toxic waste was seriously addressed. “Corruption, ignorance, incompetence — you can pick the reasons,” says Rachna Dhingra, 35, a member of an organization that advocates on behalf of the Bhopal victims. “Politicians wear masks when they talk to us,” says survivor Abdul Jabbar Khan. Khan views the announcement that the remnants of the toxic waste will finally be removed from Bhopal as “pure propaganda.” He fears that it’s just a ploy to silence the victims once and for all. But Khan refuses to be silenced. “I won’t do them that favor,” he vows.